Desert Festival - Every year in month of January or February this colourful festival is held. This festival was started to introduce the rich culture of Jaisalmer and it's people to the thousands of travellers who visit Jaisalmer at that time. During three days of festival many cultural activities are held every day. The festival starts with a long rally from the Gadisar lake that crosses the entire city to the main play ground of the city. 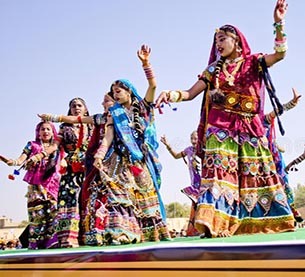 During the first two days many activities such as camel races, turban tying competitions, contests to judge the man with the best moustache, folk music and dance, fire dance, Mr Desert contest etc are held in the two main play ground of the Jaisalmer town. They also actively involved tourist in the competition and the programs. The last day of the Desert festival is held in the famous Sam Sand Dunes on the full moon day. It is 45 Km out of the town a beautiful sand dune village and every one join the final cultural programs, music and dance under the beautiful moon light. This is also an exciting time for those who loves shopping, as during the festival you could see several different kind of shops around the town ready with beautiful local items.